Many people considering the idea of artificial grass ( fake grass, synthetic grass, artificial turf ) have pets and ask us how they will react to this new surface. Many are dog owners and our Premium Artificial Grass is a perfect, realistic and durable surface for our canine friends....they love it! Dogs treat artificial grass no differently to natural grass or turf, in fact we have installed lots of fake lawns in Stevenage, Harpenden, Hertford , Biggleswade, Ware, Stotfold, St. Albans etc for many dog owners, police dog handlers, kennels, it's perfect for pets! Mrs H from St. Albans and Mr P from Harpenden asked 'will my dog like artificial grass'? Dogs find artificial grass soft and enjoyable to run and play on. There will be no more mud, stones and wee patches that completely ruin the look of natural turf. Pets will readily 'do their business' on it and it's so easy to clean and maintain you will not know what to do with all your spare time! Maybe just sit out and chill with your favourite drink and admire your beautiful artificial grass whilst the dog plays in pure bliss! If there is a smell coming from your artificial grass, we sell an artificial grass sanitiser that can easily and effectively kill all odours, just ask for details. Gone are the sun-dried, hard earth days, the too-muddy to play days and the days they can't play on the lawn because you've just put fertiliser or weedkiller down or are planning a long stint of mowing. The artificial grass is permeable so any urine drains through the turf surface and any faeces can be removed easily. You'll also have no more muddy patches to look at and no more muddy paws to clean before the dog's allowed back in the house! Every day of the year it can be the same. 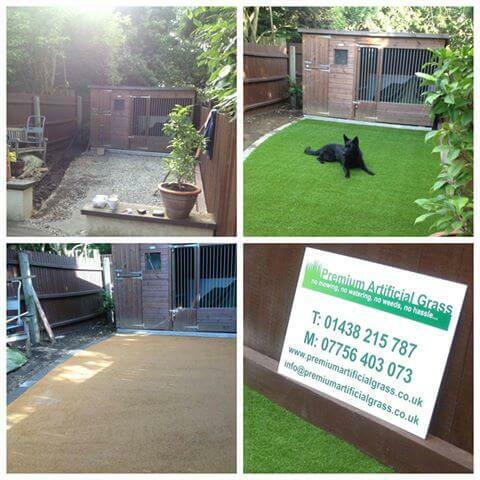 Owners of boarding kennels can also enjoy great benefits from installing a fake grass dog run. Ask for details!